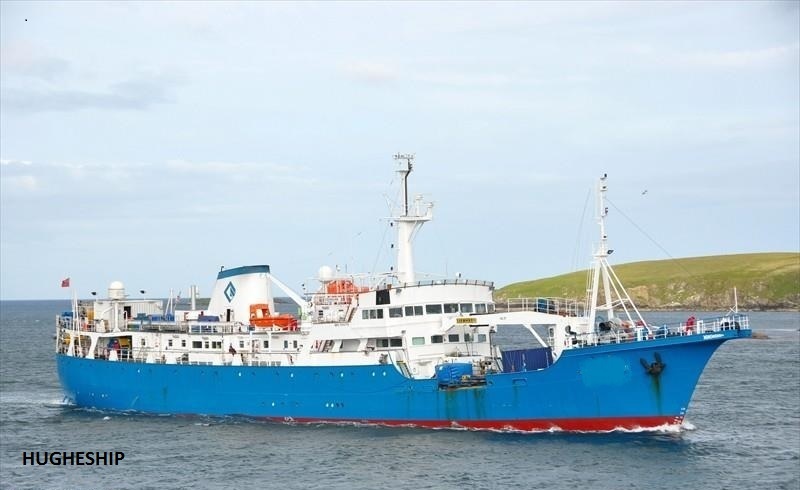 Ex Trinity House vessel more recently in the marine survey industry and now for sale. Could be a canidate for conversion to a classic yacht. A former Irish Lights support vessel originally built for buoy laying and servicing operations. Following purchase in 2000, this 81 metre vessel was modified for analogue survey and seabed sampling duties, and has worked continuously as a Burial Assessment Survey (BAS) vessel, and hydrographic survey ship. Air conditioning units were installed for use in tropical countries. Principal features include a large working fore-deck with 25T crane, ample accommodation and spacious laboratory areas. Propulsion comprises twin CP propellers and bow thruster. Consumption abt 0.4 tons per hour at max speed. – Hotel load 0.6 tonne per 24 hours. Main alternators: 3 x Ruston 300 kW + Dorman 150 kW harbour set. Emergency power Stamford 240v 26 amp gen set. Electrical distribution: 400 v 60 Hz 3 phase & 240v 60 Hz single phase. Safety 4 x 25 man RFD + 10 Life buoys + 62 Hart IMCO jackets + Immersion suits (6) + E.P.I.R.B. + S.A.R.T.S. (2) + Fire pump general service pump in engine room + diesel powered pump in forecastle. Owner asking best offers following inspection. Can advise named interests on price.